No doubt bulls continue to fret as the rally pushes deeper into this traditionally weak time of year. However, evidence shows no let up in underlying demand and the recent break of spring-summer trading ranges has offered another point of defence for bulls. Going forward the prognosis does not appear too maleovent either. So while markets may push to new lows it's unlikely the current down trend has more than a month to run. A tradable bottom is likely to present itself if not now, then inside the next few weeks. At that point markets may build a trading range governed by net accumulation (greater volume to the upside than downside) which will set the platform for the next step of the rally. The market bottomed at the start of July and evolved into a trading range which lasted to the middle of September. The trading range eventually broke to the upside and successfully back-tested (new) support at 1,130. The S&P has since advanced on low volume, which while a worry is not a deal breaker. Again, I took a look at the relative position of the S&P to its key moving averages of 20-day, 50-day and 200-day (for last Thursday) and then compared it to similar events looking back to 1950. On Thursday the S&P was 1.8% above its 20-day MA, 4.4% above it 50-day MA and 3.5% above its 200-day MA. There were 24 matching periods: June 2005, November 1999, August 1994, May 1990, June 1988, November 1985, December 1979, April 1979, May 1978, January 1967, September 1965, December 1962, December 1960, January 1960, May 1958, May 1957, June 1952. Odd congregation around May-June (6) and (November)-December-January (7), but the current setup doesn't fall neatly into this zone. I then looked at performance over the subsequent 24 days. The general behavior was for a mild bullish advance. 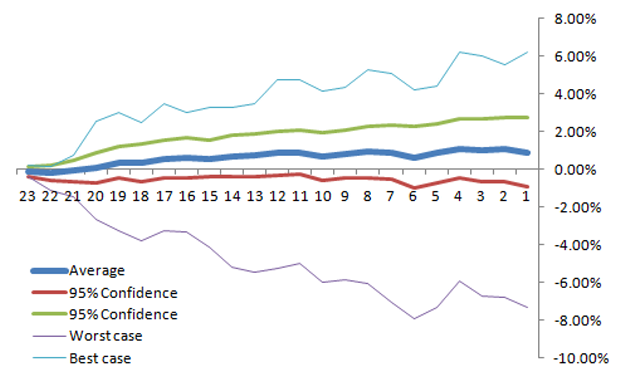 Looking at the 95% confidence interval a loss of more than 1% is not favoured and it could push to nearly a 3% gain. The worst case scenario occurred in January 1960 and the market immediately pushed downward to end with a 7.3% loss after 24 days. April 1979 was similarly negative, closing with a 5.1% loss. The best case scenario occurred in November 1985 and after a slow few days the rally kicked in to close with a 6.2% gain. Friday kick started things positively with a 0.6% gain, the same as November 1999 when the market ending gaining 2.2% after the 24 days. So, while bulls may fret they look to hold the advantage going forward. Time will tell the truth, but an immediate meltdown would be an event out of the (historical) blue. Based on this analysis, a Zignals Alert or Seeking Alpha Alerts for a loss of 1,146 ($114.73 for the SPY) will offer good protection going forward with the goal of selling after 24 days. You can track this call in my Trading Ideas tab on my Zignals Home page. Dr. Declan Fallon, Senior Market Technician for Zignals.com, offers a range of stock trading strategies via his Zignals home page. Each Zignals member has an unique home page which they can share with friends and clients to sell their strategies. Zignals offers a full suite of financial services including price and fundamental stock alerts, stock charts for Indian, Australian, Frankfurt, Euronext, UK, Ireland and Canadian stocks, tabbed stock quote watchlists, multi-currency portfolio manager, active stock screener with fundamental trading strategy support and trading system builder. Forex, precious metal and energy commodities too. Build your own trading system and sell your trading strategy in our MarketPlace to earn real cash. Read what others are saying about Zignals on Investimonials.com. JOIN US TODAY - IT'S FREE!